A huanghuali rectangular tray made of four lengths of wood joined together with a thick panel. The tray is supported on a low, splayed footrim, which forms in bracket shapes around the corners of the base. The round corners show the dovetail joints. 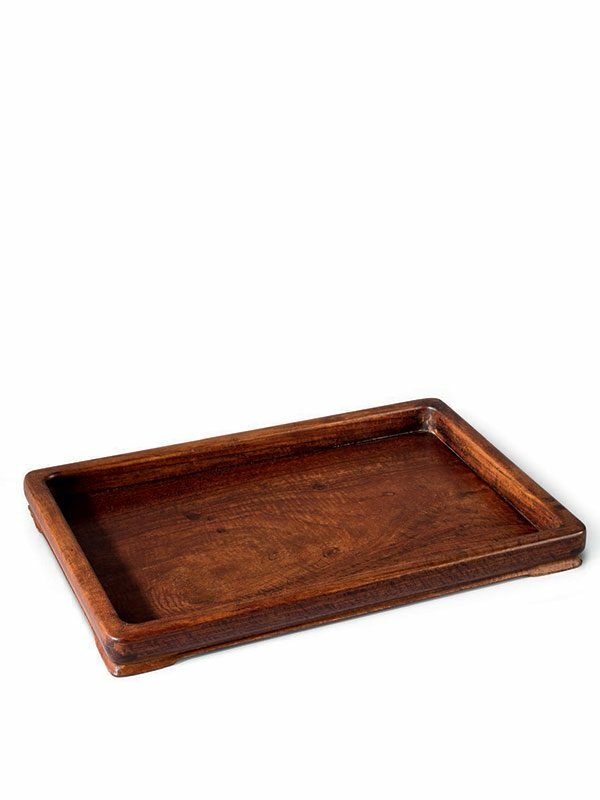 The tray is completely plain, showing the strongly-figured grain of the wood. The elegance of undecorated wood, particularly the range of hardwoods most favoured by the Chinese, is well demonstrated here. The beautifully grained huanghuali wood is highly appreciated for its richly variegated orange and brown colouring, its swirling markings known as ‘ghost’s faces’ in Chinese, and evocative patterns. This tray of small size might have once been used as a stationery tray, or as an incense tray (xian pan), which would normally hold incense utensils for ceremonial processions. A lobed tray similarly made of huanghuali wood, dated to the late 16th to early 17th century, is in the Dr. S. Y. Yip collection. Two further comparable hardwood trays made of jichimu are illustrated in Wood from the Scholar’s Table: one of lobed form is dated to the early 19th century; the other of oval form is dated to the 18th century. An oval huanghuali incense tray, used together with wood incense utensils, was formerly in the Jiansong Ge collection.